Home » Biology » Eggs Can Swim Are You Sure..? Do not think that picture above is the fried eggs that can become a meal with fried rice. The picture above is a species of jellyfish that had just been born in captivity. Photographer Torben Webber rush to take the camera and managed to take a picture when it learned of this unique creature is born. Naturally, these jellyfish live in waters of the Mediterranean. They require large amounts of sunlight to survive. This animal ditangkarkan Basel Zoo in Switzerland, when in fact this species is very difficult to reproduce. One of his staff said, "breed is really a challenge for this species. They are found only in offshore areas are remote and relatively difficult to transport to get there. "Be we have to create an artificial environment that mimics the natural environment. We provide lighting to illuminate the tank and ensure the availability of abundant food," said the staff is as reported by the Daily Mail on Wednesday (24/11/2010). 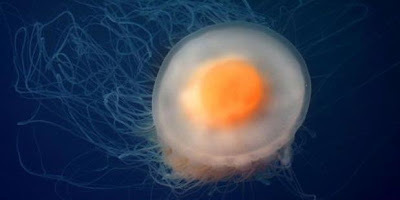 Form of the jellyfish-like fried eggs or cow eye is called the medusa. In that phase, the jellyfish can produce eggs that are fertilized in the water and develop into larvae that dwell, called polyps. When mature, the size of jellyfish that can reach 35 cm. Unlike other jellyfish, the jellyfish moves of this type with the white part of her body with movements menggelombang. Torben perpetuate the image of this jellyfish on November 4, 2010 and then with a Nikon camera D3S. He commented, "They are beautiful creatures and have an unusual shape."